Milky Way galaxy, some -- perhaps many -- may have inhabited planets and space faring civilizations. If one such civilization intercepts Voyager and can understand these recorded contents, here is our message: We are trying to survive our time so we may live into yours. We hope some day, having solved the problems we face, to join a community of Galactic Civilizations. 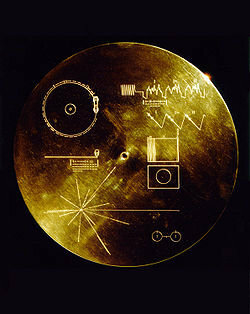 This record represents our hope and our determination and our goodwill in a vast and awesome universe. So what have we learned through this process of comparing the representation of human existence on a plaque to similar themes addressed by artists at that time? It reveals that in the case of both the Pioneer Plaque and the works of contemporary artists, the process of creating an object itself tells more about the story of humankind than a representation ever could. Through this process of thinking about the Pioneer Plaque as a story of humankind, and imagining the different ways a contemporary artist might have taken on the challenge, I’m reminded of what contemporary artists do so well: they remind us to question the object. To think about the process of making it as the valuable plot, not the content of the object itself. The context and process of telling the story or creating the object tells us more about ourselves than anything else.